I PICKED THIS UP AT A CHURCH FLEA MARKET MANY YEARS AGO IN ENGLAND. IT'S PROVEN TO WARM ME ON SOME COLD DAYS AND CELEBRATE SOME BIG FISH ON OTHERS. 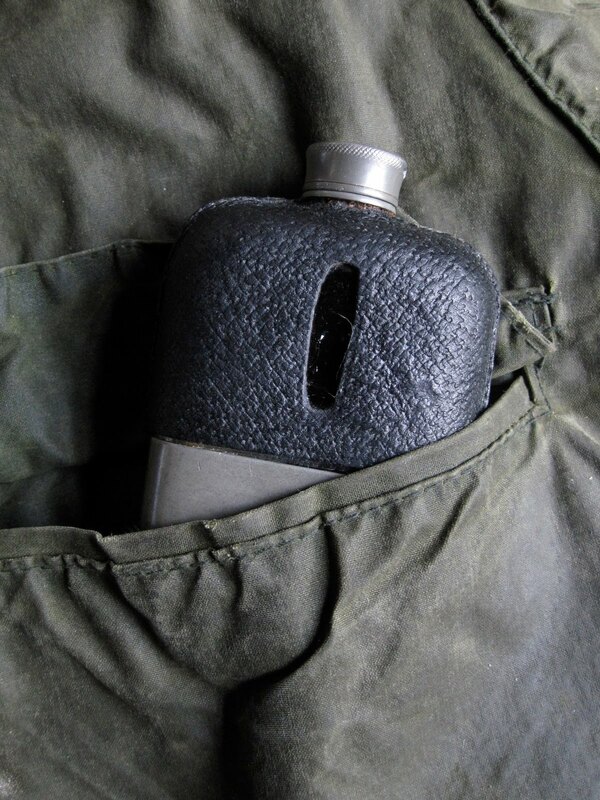 THE FLASK IS A PERFECT SIZE FOR A POCKET AND SHARES WELL. IT IS WRAPPED IN LEATHER UP TOP AND PROTECTED BY PEWTER ON THE BOTTOM. THE WINDOW IS HELPFUL TO SEE IF YOU NEED TO REFILL BEFORE YOU LEAVE THE COMFORTS OF THE HOUSE OR CABIN. IT HOLDS ABOUT TWO JIGGERS OF MY FAVORITE SPIRIT AND MORE OFTEN THAN NOT, THAT IS SCOTCH OR WHISKEY STREAM SIDE. beautiful flask! doing any fishing this weekend?